I love to cook, but let's face it, cooking for one is tough and tricky (and for me, not too inspiring). When Mr. C. travels, you'll more often than not, find me with a simple bowl of cereal. And while easy, it's hardly nutritious or filling for too long. However, in effort clean up our menu after a long weekend spent at the lake enjoying every morsel of junk food, I threw together this delicious, super easy salad. True to it's name it features a little bit of everything which keeps the taste-buds guessing, but also allows for easy substitution for whatever is fresh and ready. Simply combine all the elements and top with the drizzle of oil and a dash of salt and pepper. Done and done. This salad is a bit thrown together and that's the beauty of it. Have radishes, throw them in. Celery? Sure. A bit of onion rather than scallion, that works too. Completely guilt-free and gorgeous, this salad is the perfect weeknight meal that easily feels like a treat. - This couldn't have come a more perfect time. Just a few little reminders to on how to disconnect. - After a busy work day, the idea of cooking can be a bit daunting, Enter the modern marvel of a crock pot. We dusted ours off the other night and it was so worth it. Being greeted by the scent of a ready, delicious meal as soon as you walk in the door is such a treat (and helps ward off those in munchies that can set in as your setting up). This board features super yummy-looking ideas for easy weeknight dinners. - Embrace what you love. I love vintage cookbooks and etiquette guides. (I can get lost in Bonnie Slotnick Cookbooks.) While this one is newer, it appears to have that vintage inspired feel. -Is there anything better than a Friday Night? One that includes wine and cheese. Check out how to build the perfect cheese platter. - I love Dill Pickles, but the idea of making them has been a bit intimidating and time consuming. This recipe seems super easy, and is on my list for this weekend! - I (obviously) adore a well curated list. This one bullets out all the items you should toss by the time your 30. - This dreamy apartment makes a historic home feel entirely fresh and airy. Drink Up - Gorgeous pitchers make it easier! I'm not one for resolutions. However, every December I'm inevitably faced with the question, "So, what is your resolution?" Cringe. This year, like most others, it's the same - just be "better" at things - floss more, do more charity, commit to yoga, the usual. Healthy to-dos that often get sidelined when life gets busy. Then I read that model Hilary Rhoda would resolve to drink more water every time it was asked if she wanted something to drink. Genius! 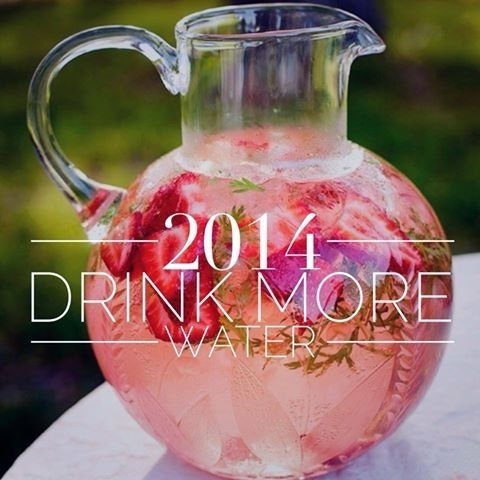 I never drink enough water, and if she needs some, I definitely do - resolution conundrum solved! I'm happy to report that as we enter March, this is one thing that I've kept to. I may not be up to the prescribed 8 glasses, but definitely getting better! As for the yoga, well I did watch a video, on a mat, wearing my yoga clothes - that sort of counts, right?